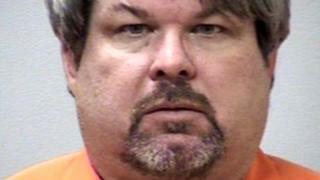 Image caption Jason Dalton had initially blamed the Uber app for his actions, saying it made him a "puppet"
An Uber driver accused of killing six people at random in a shooting spree in the US state of Michigan in 2016 has pleaded guilty to murder, attempted murder and firearms offences. Four people were killed at a restaurant and two at a car dealership in the shootings in the city of Kalamazoo. Jason Dalton, 48, had initially blamed the app for controlling his "mind and body". But he changed his plea shortly before his trial was due to begin. No deal was offered to Mr Dalton for the guilty plea, prosecutors said. His charges consist of six counts of murder, two counts of attempted murder and eight charges relating to firearms offences. He now faces a mandatory life sentence without parole. Mr Dalton, who submitted his plea while jury selection was taking place, did so despite the objections of his attorney. He told the judge at the Kalamazoo County court that he had made the decision of his own free will, adding that he had "wanted this for quite a while". Mr Dalton had earlier reportedly told police that he was made a "puppet" by the Uber application, which directed him to shoot people at random over a five-hour period in February 2016. Although none of the victims were Uber customers, police said Mr Dalton continued to pick up passengers during the shooting spree in Kalamazoo, a small city about 150 miles (241km) west of Detroit. The shootings took place on a Saturday evening at three locations - outside a Cracker Barrel restaurant, a Kia car dealership and an apartment block. Following his arrest that evening, Uber confirmed that Mr Dalton was a driver registered with the app-based cab-hailing company, issuing a statement saying that it was "horrified and heartbroken" at the violence. Mr Dalton had undergone background checks but passed because he had no criminal record, Uber said.